The Body-Solid G10B features Bi-Angular® Technology. The Bi-Angular Press Arm guides you through the optimal range of motion while applying resistance from two directions. The smooth, multi-directional resistance increases muscle interaction by 25%. Your exercises become more intense and your results more apparent. The adjustable Bi-Angular Arms give the user several starting points for Chest Press, Shoulder Press / Incline Press. The G10B comes with the Perfect Pec™ Station. It is equipped with swivel arms, adjustable range of motion and designed for both unilateral and bilateral movements so you can get the maximum stretch for deep muscle toning, and the most incredible upper body development possible. Born in the health club, the Seated Leg Curl / Leg Extension Station was designed with adjustable cams to precisely fit the exercise to the user. Round out your workouts on the High, Mid and Low Pulleys with Lat Pull Downs, Weight Resistance Crunches and Standing Bicep Curls. The extra thick DuraFirm™ padding, lumbar support, 2×3 steel framing and two 210 lb. weight stacks allow multiple fitness enthusiasts to exercise in comfort and safety simultaneously. 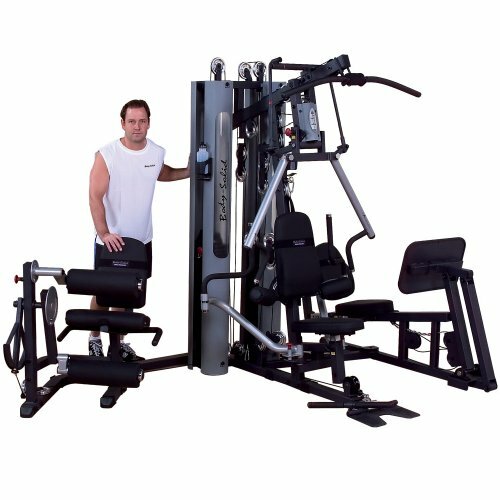 This package also comes with the GLP Leg Press which adds a 3rd main station option to your ever growing workout arsenal. The Leg Press Station features a 2:1 which means the standard 210 lb. weight stack feels more like 420 lbs. Also available is the SP50 50 lb. weight stack upgrade. With this your new 260 lb. weight stack will have the awesome feel of 520 lbs.